Museum of International Folk Art in Santa Fe. One of the most fascinating part of our trip was to the Museum of International Folk Art in Santa Fe. We could have stayed there all day, but we only had 3 hours because we had other museums to see. If you are ever in this vicinity… please take the time to view it. Material World presents a tantalizing glimpse into the Museum of International Folk Art's largest collection of textiles and costumes stored in 57 closets and numerous trunks and drawers. The 138 rarely-seen items in this exhibition highlight the remarkable breadth and depth of 20,000 objects ranging from everyday household articles to elaborately detailed ceremonial wear in the Museum's textile collection. View the images in my gallery. 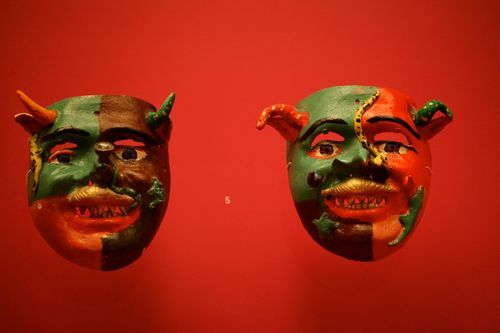 Folk Expression in the Face of Natural Disaster explores how folk artists have helped their communities recover from four recent natural disasters: the Haitian Earthquake; Hurricane Katrina on the U.S. Gulf Coast; floods in Pakistan; and the volcanic eruption of Mt. Merapi in Indonesia. Tagged with: Museum of International Folk Art in Santa Fe. Pam – what fab photos I wish I was with you – you have had such a wonderful time – trying to get computer smart – bought an IPad2 and a new printer so will speak when you get back – need to start my blog – enjoy!!! Thank you for the fab pictures of International Museum of FOlk Art in Santa FE. It is one of my favorite museums! What I treat! Martha I have more to put up, thanks for reminding me. Next PostSeaweed, coffee and a health bar.